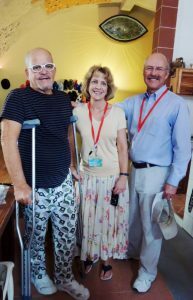 La Cañada Flintridge residents Dr. Paul Gilbert (right) and his wife, Cindy, a registered nurse, visit a patient during a medical mission to Havana. Gilbert is the medical director for Operation Walk and an orthopedic surgeon at USC Verdugo Hills Hospital. The moment a physically disabled patient can stand and walk for the first time without pain is one that Dr. Lawrence Dorr never tires of witnessing. As an international leader in the field of orthopedics, Dorr has sought to give that gift of mobility and hope to as many as possible, including those who otherwise would never be able to afford it, in some of the most remote places of the world. Through Operation Walk, the former longtime La Cañada Flintridge resident found the vehicle that would take him around the globe and change lives — not just of those able to walk again, but of everyone who shares in the experience. Cecilia Cayton was helping a woman named Angela prepare for her journey home. Angela was fresh off hip replacement surgery and about to board a bus.